The JAZZ ORCHESTRA is a jazz based ensemble performing intermediate arrangements of contemporary popular music in various styles. 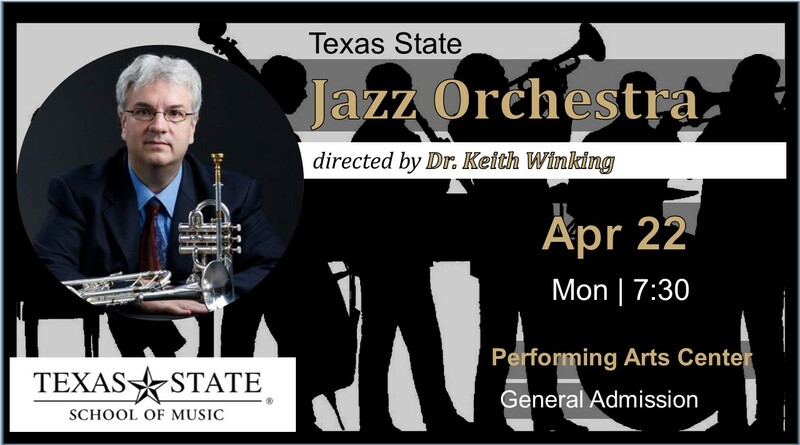 DR. KEITH WINKING has presented solo and ensemble concerts and clinics throughout the United States, Canada, Chile, Sweden, Japan, Switzerland and Russia. He is a freelance trumpet player, performing with many local and national groups, including the Austin Symphony, the Austin Jazz Orchestra, James Brown, the Manhattan Transfer, and the Austin Sinfonietta. He has extensive recording experience and has recorded national jingles for McDonalds and American Express. He has also taped numerous TV shows, including PBS's "Lonesome Pines," TNN's "Texas Connection," PBS's "Austin City Limits" and a taping for the BBC entitled "Rhythms of the World." He has presented papers at the International Trumpet and New York Brass Conferences and also published articles in The International Trumpet Guild Journal and the International Jazz Educators Journal. Dr. Winking is voting member of the National Association of the Recording Arts and Sciences (Grammy's) and a clinician for the Selmer Company.